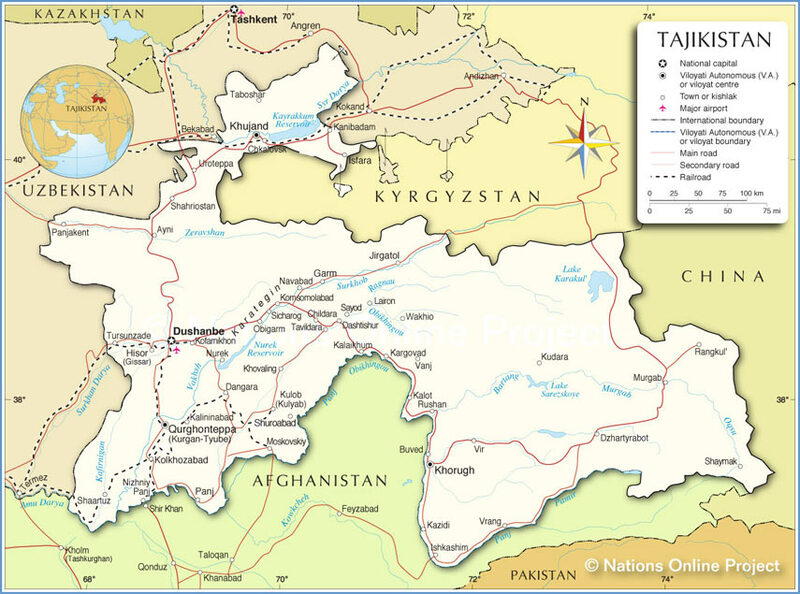 Geography: The Republic of Tadjikistan is situated in the Central Asia between 36°40' of the northern latitude and 67°31' and 75°14' of the eastern longitude. 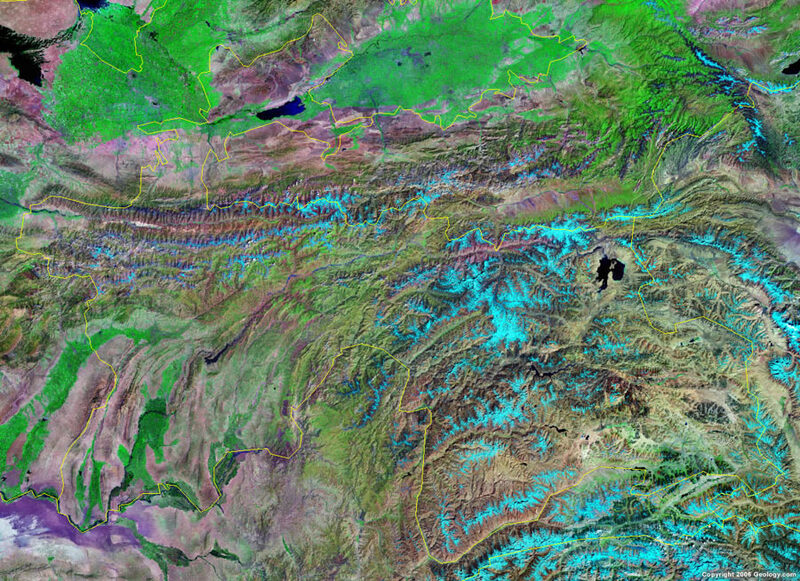 The mountains occupy 93% of its territory, while almost the half of the country is located above 3000 m on the sea level, most notably by the sparsely populated Pamir Mountains, which include Pik Kommunizma, mountainous ridges of Tyuan Shan. 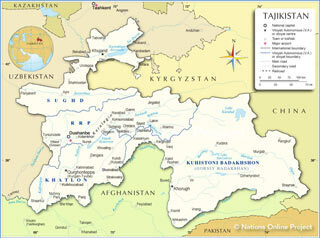 The Republic of Tadjikistan stretches as long as 700 km from west to east, and 350 km from the north to the south. Acreage rates 143 sq.km. It was complex contours, that reflect historic and geographic peculiarities of the Tadjik dwelling mode across the Central Asia. 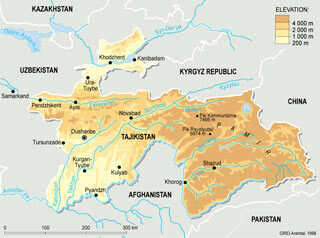 There is narrow band of the Afghan territory in the south-east of Tadjikistan, that ranges between 15 to 65 km in width. In the west it embraces desert and semi-desert fragments of the Turan Lowlands that got transformed into plateau and valley. Climate: Midlatitude continental, hot summers, mild winters; semiarid to polar in Pamir Mountains The Tadjik climates gets formated as being influenced by the interaction of a number of factors determined, primarily, by its geographic location, surface composition, air circulation and sun radiation, the latter being the most significant of all. 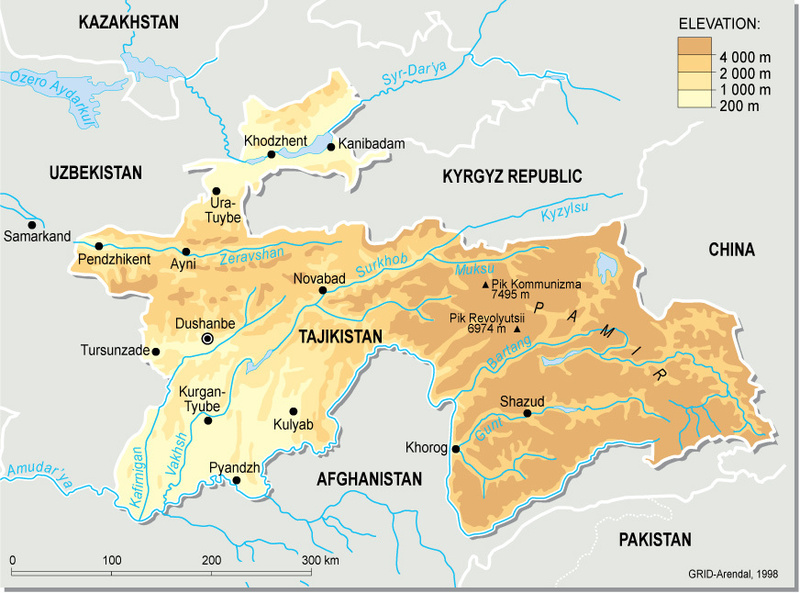 Geographic location of Tadjikistan is peculiar because the country is situated far from open oceans and seas, within the continent of Eurasia. That is why its climate is sharply continental, being characterised by swift seasonal and daily fluctuations of meteorological components. Relatively cold winter is suddenly replaced by rainy spring, that is, also suddenly, followed by arid summer, given almost entire absence of precipitation throughout several months, while highland regions of Pamir make an exception. Warm and dry weather in autumn is suddenly replaced by cold and rainy, often frosty one, quickly followed by warm sunny days. 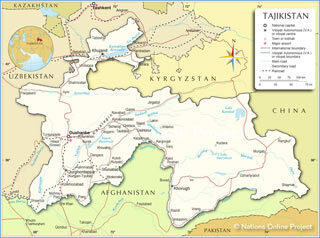 South oriented location of Tadjikistan (36 - 42 C.) provides for the high solstice. Annual average sunshine ranges between 2,097 and 3,166 hours. During the winter and summer solstice periods, the sun height rates 28 C and nearly 75 C respectively. In this respect, annual average of the aggregate radiation reaches 151 to 176 kKal/ sq.sm. Complexity of the relief and big amplitude of heights of mountain system leads to formation of local types of climate. The lowest annual average temperature is at highlands, while it declines as the height of a location gets less. 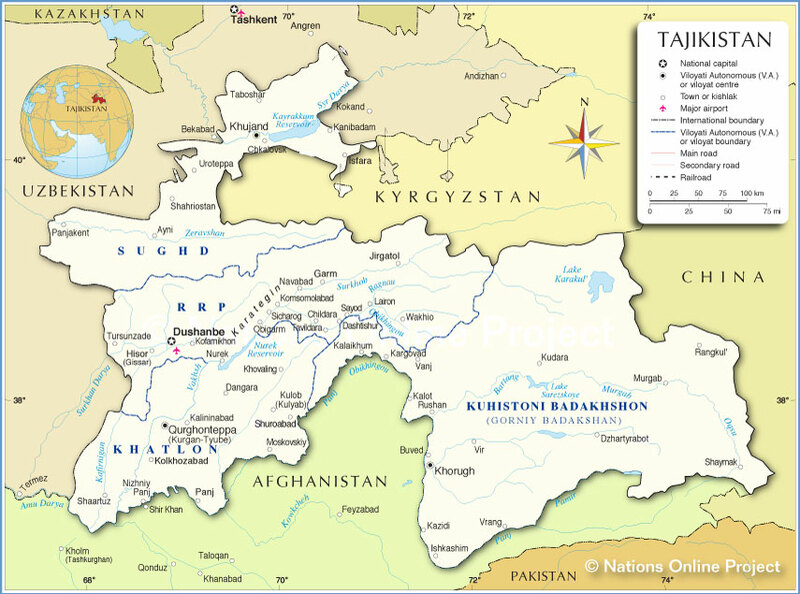 Thus, Gorbunov meteostation (4,169 m) it equals 6.9 C, while in the extreme south-west (Aivadj and Shaatuz) it increases up to 16.4 -17,2 C. As regards lowlands and piedmont regions of Tadjikistan, average temperatures of the coldest month, January, range between + 2 C to -2 C. Temperatures that are higher than +2 C are typical for the lower parts of Kafirnigan and western part of Gissar Valley, that range between up to 700 m above the sea level. The zero isotherm of January is observed at considerably higher highs than those in many other parts of the Central Asia. The positive January temperature value ranges between 900 and 1,100m, as regards southern parts of Tadjikistan. 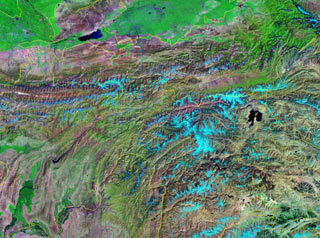 Annual flow of precipitation is not adequate in diverse regions of the country. The state flag of the Republic of Tajikistan represents a right-angled panel consisting from three colored stripes located horizontal: the top stripe - red color and equal to it on width the bottom stripe of green color, the average white stripe, making one and a half width of dense stripes. On a white stripe, in the center there is a stylized gold crown and a semicircle from seven stars above it. The attitude of the general width of a flag to length is 1:2. The crown and a star are entered in a rectangle, the sides of which on a vertical make 0,8 and across 1,0 width of a white stripe. Five-pointed stars are entered in a circle with diameter 0,15 and settle down on an arch radius of 0,5 width of a white stripe. 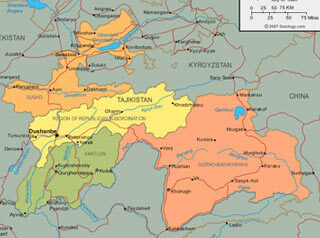 There are three colors on a flag of the Republic of Tajikistan: green, red and white. A green stripe are valleys, they are not enough in republic - 7 % of territory. Mountains occupy the rest of the territory. The white stripe is a color of the main richness of republic - cotton and also the color of snow and ice in high mountains. The red color is a color of unification of republic and brotherhood with other nations of the world. The State Emblem of the Republic of Tajikistan represents the image of stylized crown and semicircle from which is made on. The right from ears of wheat and on the left from branches of a cotton From above a wreath seven stars on it in the beams of sun arising behind of the mountains, covered with snow and framed by wreath is interlaced by a three-striped tape and in the bottom sector there is placed a book on the support.